Burgess Hill has seen a considerable reduction in anti-social behaviour following ‘robust’ action by local prevention officers and partner agencies, according to Sussex Police. Officers and PCSOs have conducted high visibility patrols in the town centre and St John’s Park area, directly interacting with anyone committing ASB and removing them from the area, a spokesman said. This has resulted in incidents of ASB dropping considerably in these areas. A spokesman for Sussex Police said: “By working closely with the local community and those directly affected, the prevention team have been able to issue acceptable behavioural contracts to nine perpetrators banning them from the town centre areas. “As a result, the incidents of ASB in Burgess Hill have dropped considerably in these areas. PCSO Nathan Lax is part of the frontline team who have worked closely with the community to target the perpetrators and support vulnerable victims of the anti-social behaviour. 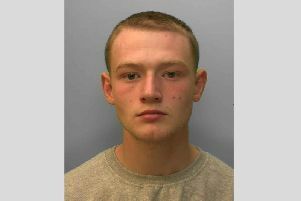 He joined the Mid Sussex Prevention Team in October. Prevent Inspector Pete Dommett said he and the team have undertaken robust activity to tackle ASB in the town centre and St John’s Park area since autumn, following concerns rasied by the community. He said: “In partnership with Mid Sussex District Council, West Sussex County Council and Burgess Hill Town Council, we have confronted, challenged and taken action against the group of youths responsible, removing them from these areas. No single agency can succeed on its own, joint partnership working is the best way forward. A huge thank you to all who have been involved. Mr Dommett said members of the public and shop owners have felt ‘greatly reassured’ by the considerable reduction in incidents reported. He added: “The close relations our PCSOs and police officers have developed with local business owners and other members of the community, including victims targeted by the group, have been invaluable in developing the intelligence necessary to robustly target these perpetrators. “We have particularly appreciated the innovative outreach work of the elected members of Burgess Hill Town Council within key parishes. Councillor Pru Moore, leader of the town council, thanked everyone who has been involved. “This has been a long journey since last summer,” she said. “Burgess Hill Town Council is delighted to see the positive results from all our efforts. Anyone affected by ASB in the area is encouraged to report incidents to the police without delay. You can report online or call 101. Sussex Police has welcomed the decision to raise the policing element of the council tax, which will strengthen local policing teams by 200 people over the next four years, with the recruitment of more PCSOs, police officers and specialist staff.